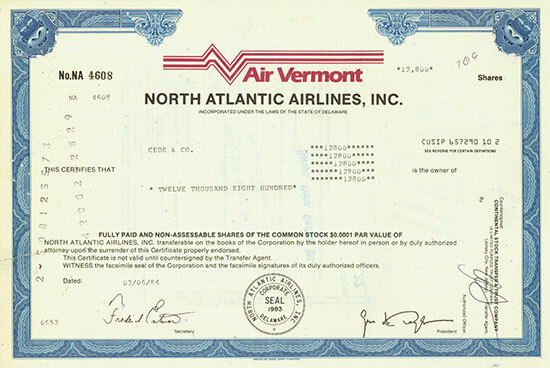 HWPH AG - Acciones antiguas - Air Vermont - North Atlantic Airlines, Inc.
Air Vermont - North Atlantic Airlines, Inc.
06.03.1984, 12.800 Shares of US-$ 0,0001, #NA4608, 20,3 x 30,3 cm, blau, weinrot, schwarz, weiß, Perforation. 6 March 1984, 12,800 Shares of US-$ 0.0001, #NA4608, 20.3 x 30.3 cm, blue, maroon, black, white, perforation. Air Vermont war eine Zubringer-Airline, die in Morrisville, Vermont, USA, beheimatet war. Sie wurde 1981 gegründet, lautete ab 1983 nur noch North Atlantic Airlines und musste bereits 1984 den Betrieb einstellen. Air Vermont was a commuter airline in the United States based in Morrisville, Vermont. It was established in 1981, renamed to North Atlantic Airlines in 1983, and suspended operations in 1984.